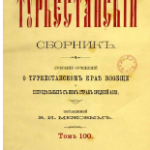 The Turkestan Collection is a comprehensive collection of 594 volumes of printed material relating to the history, culture, ethnography, geography, economics, social life and traditions of Turkestan and Central Asian countries from the 1867s until 1939. The collection also includes material about the region written in other parts of the world. 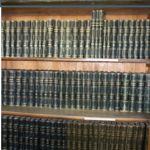 It is the most comprehensive resource available for the study of the region over the period as it brings together both published and manuscript material in one place. Some of the published materials are now only available in this collection because other copies have been destroyed during wars and revolutions. The collection was started in 1867 when Russia identified the need to understand the industrial potential of the region. There was a scarcity of information available at the time, but once the collection was started the reports of scientists and researchers were quickly added.The early collection was supplemented by a number of translations of foreign documents. This also coincided with the time when the first articles on the politics, economy, history, ethnography and culture of Central Asia were being published, and with the time of the establishment of the Russian administration. 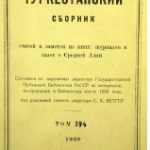 The early part of the collection therefore also includes detailed information on the relationship of the Russian administration with the local people. Later volumes cover many topics including trade in Central Asia, coal exploration, the construction of railways and Russian military operations in Samarkand, Bukhara, Kokand and Khiva and in other regions. The collection’s diversity is also illustrated by the inclusion of topographic surveys, astronomical observations, statistical information, reports on expeditions and geological research.